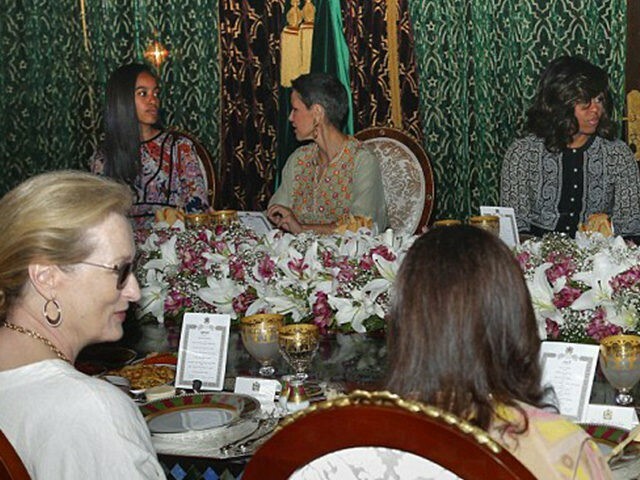 Actress Meryl Streep and First Lady Michelle Obama joined Princess Lalla Salma in Morocco on Tuesday night for a traditional dinner to break the fast of Ramadan, after the three spent the afternoon speaking with local high school girls about the importance of female education and empowerment. Streep, Princess Salma and members of the Moroccan royal family gathered at the King’s Palace in Marrakesh Tuesday night for a traditional Moroccan iftar, the dinner eaten to break the fast after sundown during the Muslim holy month of Ramadan, according to the Daily Mail. 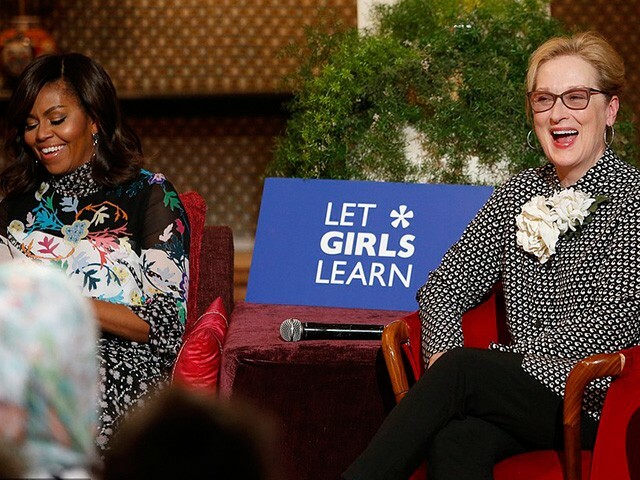 Streep, Obama and Princess Salma were joined by Sasha and Malia Obama and actress Frieda Pinto on the taxpayer-funded trip, conducted to promote the White House’s Let Girls Learn female education initiative. The First Family visited Liberia on Monday and were scheduled to travel to Spain on Wednesday. Earlier Tuesday, Streep joined the First Lady to speak to an audience of high school girls, with the pair delivering inspirational messages to the young women in attendance. “If Mrs. Obama asked me to road-trip anywhere in the world I would say, ‘I’m there in five minutes,'” Streep added. The First Family’s trip six-day international trip is likely to cost taxpayers nearly $300,000 in airfare alone, according to a previous estimate conducted by the Daily Mail. The First Lady’s plane reportedly costs more than $11,000 per hour to operate. The White House announced Tuesday that Morocco would become the latest country to join the Let Girls Learn initiative. The Millennium Corporation will make a $100 million investment into girls’ education in the country, while USAID will spend $400,000 to construct five new girls dormitories, which will be ready for the upcoming school year. “I am so proud that the U.S. is working with the Moroccan Government to make these transformative new investments to educate and empower girls across Morocco – investments that will help these girls succeed in the workforce and fulfill their boundless promise,” the First Lady said in a statement.